Enjoy luxurious accommodation in Lorne. 3 bedroom 2 bathrooms, 3 balconies. Enjoy the best of the best that this five star home can offer you.Beautiful furnishings, with the best views of the Ocean and bushland.Wake up in the tree tops with the sounds of the parrots and kookaburras. Walk to the beach for a swim. What more could you want? Stylish 3 Bedroom Multi Storey Home with 1 King bed, 1 Queen bed, 2 x Single Beds sleeps up to 6 people. A fold out couch is also available but suitable only for children. All bedrooms with robes, master with ensuite plus a second bathroom. Fully self-contained with modern furnishings, quality linen & towels provided for your comfort. Each bedroom is airconditioned, and the family area is also. There is an open fire for added warmth in winter! Lorne Luxury has a open plan Living/Kitchen/Dining area opening onto two entertaining decks with ocean views whilst being set amongst the trees, if this isn't enough there's another private deck upstairs to enjoy the view from! There are 2 x car spaces undercover and off the street. You can stroll to beach, restaurants and shops. View Loutit Bay, Lorne from all rooms. A very well maintained home, great communication from the owner, fantastic views and easy trip into town by car. Steep walk back up the hill from the town and beach if not using the car but OK for anyone with moderate fitness. 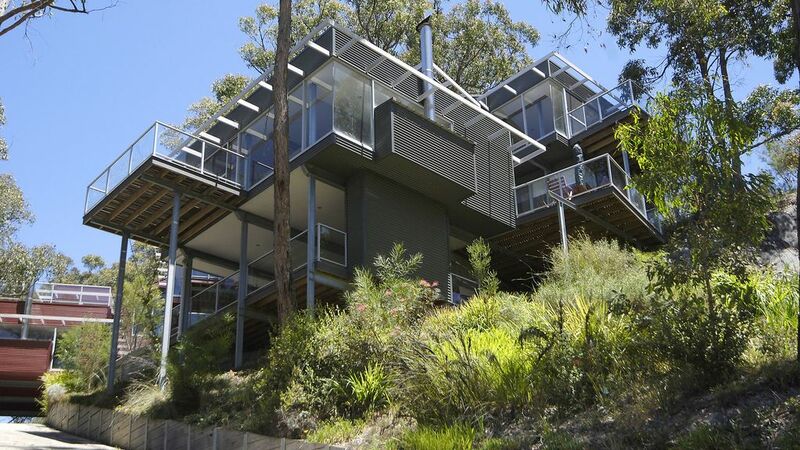 A great holiday home and we would highly recommend this property for anyone visiting Lorne. Such a beautiful home. We loved it. We enjoyed the beautiful views. Peaceful atmosphere and being amongst the bird life. How lucky are we to enjoy these experiences. Thanks for a memorable time with great friends. Stunning house with wonderful views. We loved this house with it’s cosy fire & wonderful views. Worth the tough walk up the hill. Well appointed kitchen & very comfortable bedrooms. Wish we could have stayed longer! Great place , house was fantastic and we loved the views! Very relaxing stay with a great location. The host was very helpful and available if we needed anything. The house was well appointed, with the extra detail, such as a welcome pack , lovely bath products and extra blankets ! We love the views from each story and each room and enjoyed the cockatoos and rosellas ! What a fantastic house ! Design,position,fittings,furnishings through to communication with Bryan the owner was first class.The only constructive criticism I would offer is that there could be enough fire wood supplied for the duration of stay as unfortunately I needed to buy a few bags at a premium,obviously only an issue in the colder months . Even in light of this minor issue ,I would not hesitate staying here again and look forward to it . We had a great few days !!!! Lorne is a town on the Great Ocean Road in Victoria, Australia. Across from Lorne Beach, a popular surfing spot, Mountjoy Parade has many shops and cafes. The town is known for its arts community, including institutions like Qdos ARTS, with its gallery and sculpture park. Teddy's Lookout has sweeping views over the St. George River and the coast. Nearby are Angahook Lorne State Park and Erskine Falls, set amid ferns. The warm months of Oct–Mar are a popular time to visit the beach, and summer (Dec–Feb) is particularly bustling. Winter (Jun–Aug) is cool. The GMHBA Lorne Pier to Pub (Jan) is a 1.2km open-water swim. Lorne is known for whale watching, with sightings most common May–Sep. Arts events include the Lorne Sculpture Biennale (Mar, every 2 years), which sees public art along the Lorne foreshore. The Falls Music and Arts Festival (Dec/Jan) presents big-name international bands.